580 Executive Center has provided an extremely valuable and cost-effective platform to grow my business. They have supplied all the services my business needs in a very friendly and professional environment. The service is full on over the top. They are always friendly and full of smiles. They make you feel loved. It's a great place to do business. Our Team is delighted to have offices in this professional space at 580 Executive Suites. Since day one, 580's commitment to hospitality has been exceptional. The staff is flexible and quick to accommodate our every need. We are pleased to invite guests and high-level donors to our offices because we know they will be warmly welcomed with the highest level of professionalism. I love the environment here! Everyone on the staff has a pleasant and warm personality. The service is impeccable. If I ever have any questions they are always there to help me. I enjoy the hospitality – the bagels and coffee. This is a special place; it feels like family members. It’s why I will always have my office here. SMGI searched long and hard to find the right “fit” for our company and found it here at 580 Executive Center. The offices are stellar, flexible and comfortable but more importantly the staff are always welcoming, accommodating, and do whatever they can to make our lives easier and our presence here delightful. When we relocated our offices to 580 Executive Center we found more than excellent offices, we found a home and a family! The 580 Executive Center provides seamless handling of peripheral tasks to small business owners like me, resulting in additional time for me to concentrate on the critical core elements of my business. As their client, the staff treats me in exactly the same way as I strive to treat my own clients; with intelligence, professionalism and friendliness. My company started at the 580 Executive Center in February of this year. The facilities are excellent and the staff makes you feel like part of a family. I have visited other professional office facilities and have never found the combination of friendly support and clean modern facilities at this level. Our whole team loves it here and we are planning to expand our presence here. My thanks to the entire 580 Executive staff. Cornerstone Technologies cares about delivering the very best services for our customers. It’s only fitting that we utilize the services of others that adhere to the same high standards of customer service. The people at 580 Executive Center set the bar for full-service executive offices. I have enjoyed working here at the 580 Executive Center for the past four months. It is an extremely professional environment that allows each business to be contained but yet part of a community. The office management staff has helped when anything needs I have had and this is greatly appreciated when I am busy with work. Thank you 580 Executive Center for providing a great place to work. The location of the 580 Executive Center is what initially drew us to consider taking an office here. We have work in the South Bay and peninsula. With employees coming from East Bay, Dublin and Fremont, and our work mostly being south, this location works well for all of us. We appreciate that the management and staff are very engaged with all the businesses in the building and really know who is in the building and how to care for the needs of each company. The friendly but professional hospitality is very appreciated. 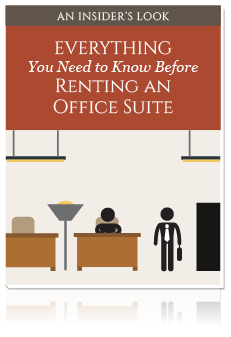 A comprehensive guide to every question you need answered before picking an office location for your business. 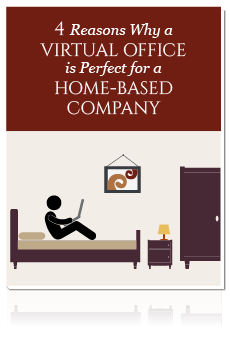 A look at the biggest benefits a virtual office will provide you while running a business from home. 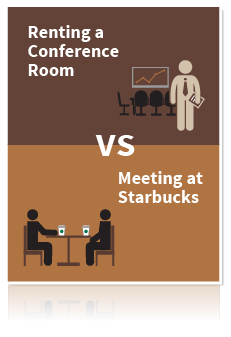 The pros and cons of having a meeting at a professional conference room versus a local coffee shop.